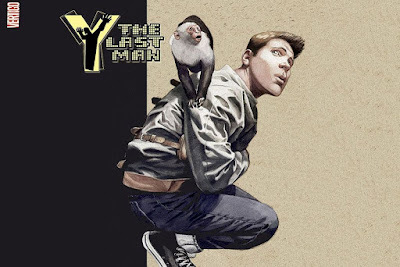 FX has ordered a pilot for the post-apocalyptic science fiction series Y: The Last Man, based on the Vertigo comic book series that ran from 2002-2006. First reported by Variety, the series is about the lone surviving man on Earth who survives the simultaneous deaths of all other male mammals, except for his pet monkey. Michael Green (American Gods,Blade Runner 2049,Logan) and Aida Mashaka Croal (Luke Cage,Turn) will serve as co-showrunners on the project, serving as executive producers with Nina Jacobson and Brad Simpson of Color Force (American Crime Story, Pose, The Hunger Games) and Brian K. Vaughan. Melina Matsoukas (Insecure, Master of None, Beyonce: Formation) has been tapped to direct the pilot and will also serve as an executive producer. Created by Vaughn and Pia Guerra, the series was published in sixty issues and was also released in a series on ten trade paperbacks. It was the first novel to be nominated for a Hugo Award for Best Graphic Story and won three Eisner awards, the top comic book honor. It has went through developmental hell since New Line Cinema first acquired the rights in 2007 for a potential feature film. As recently as 2013, Dan Trachtenberg had been tapped to direct a film adaptation that never came to fruition. Once New Line’s rights lapsed, FX has spent the past two years working on adapting it into a television series.